"A garden for fun, a garden that answers to no one, sprinkled with light." - Jean-Claude EllenaUn Jardin sur le Toit is a lively, edgy novella. This perfume describes a secret garden, nestled in the heart of the city in Paris. A hanging garden, perched on the roof of the house of Hermes, at 24 Faubourg Saint-Honore. An apple tree, a pear tree, a magnolia in the Paris air, along with a few self-seeded imposters, all making up this perfume of light and pleasure, enticing and full of laughter. Body shower gel. An unctuous gel that transforms into a fine foam. Easy to rinse. Delicately scented, the skin is soft and supple- 6.7 oz. 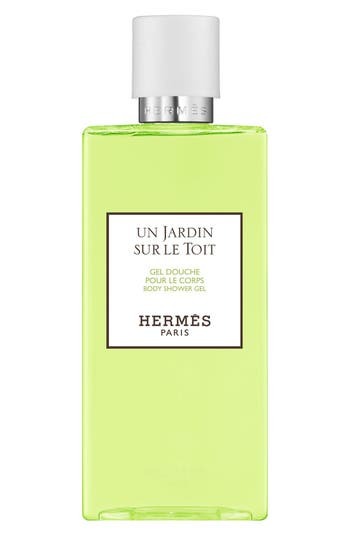 Style Name: Hermes Le Jardin Sur Le Toit - Body Shower Gel. Style Number: 1152195. Available in stores. "I wanted to express the essence of femininity with flowers and nothing but flowers." - Jean-Claude Ellena. Femininity in perfume form! A celebration of the birth and rebirth of woman, every day, Jour d`Hermes brings to light the beauty of woman, while maintaining the mystery of each individual woman. A profusion of bouquets. From dawn to dusk, here is a floral that flowers, a blossom that blooms. The eau de parfum is luminous and sensuous, with sweet peas and gardenia. Style Name: Hermes Jour D'Hermes - Eau De Parfum Spray. Style Number: 648644. Available in stores. "I wanted to express the essence of femininity with flowers and nothing but flowers." - Jean-Claude Ellena. Femininity in perfume form! A celebration of the birth and rebirth of woman, every day, Jour d`Hermes brings to light the beauty of woman, while maintaining the mystery of each individual woman. A profusion of bouquets. From dawn to dusk, here is a floral that flowers, a blossom that blooms. 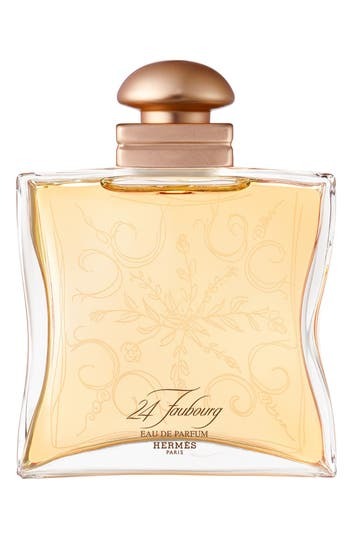 Jour d`Hermes Absolu, a floral declaration in the absolute, a radiant profusion of flowers, voluptuous and sensual. Gardenia, sambac jasmine, apricot flower. Style Name: Hermes Jour D'Hermes Absolu - Eau De Parfum. Style Number: 789414. Available in stores. "Perfume in the absolute. An explosion of white flowers, enveloping warmth, captivating sensuality." - Jean-Claude Ellena.A novel composed by Maurice Roucel in 1995, 24, Faubourg is an invitation to travel, with the sun as its destination. A sparkle of white flowers in the top notes, the radiance of a floral heart enveloped in irises, woods and mystery, while vanilla and ambergris set the tone for the sillage. Eau de toilette, late morning full of sunshine. Style Name: Hermes 24, Faubourg - Eau De Toilette. Style Number: 394585. Available in stores. "The perfume of enchantment. An amber wood for women, surprising and magical." - Jean-Claude Ellena. From surprise to magic and from magic to enchantment, Eau des Merveilles leads us by the nose on a dream cloud. A multi-facetted novel built on a woody amber accord that resonates right through to the top notes, this fragrance was created in 2004 by Ralph Schwieger and Nathalie Feisthauer. It successfully takes on the challenge of being a sparkling women's perfume with not a flower in sight. The eau de parfum, warm and sensual. 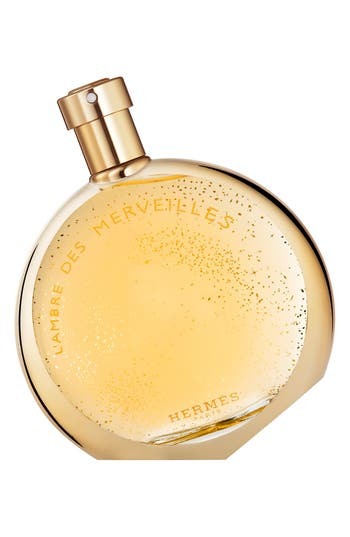 Style Name: Hermes Eau Des Merveilles L'Ambre Des Merveilles - Eau De Parfum. Style Number: 583790. Available in stores. "I remembered the smell of ponds, the smell of jasmine, the smell of wet stones, of plum trees, kumquats and giant bamboos. It was all there, and in the ponds there were even carp steadily working towards their hundredth birthday." -Jean-Claude EllenaLe Jardin de Monsieur Li describes a Chinese garden somewhere between reality and imagination. A place for meditation where strolling is allied to thought, and every step sets the imagination free. Winner of Allure magazine's 'Best of Beauty' award for Best Citrus Fragrance, 2015. 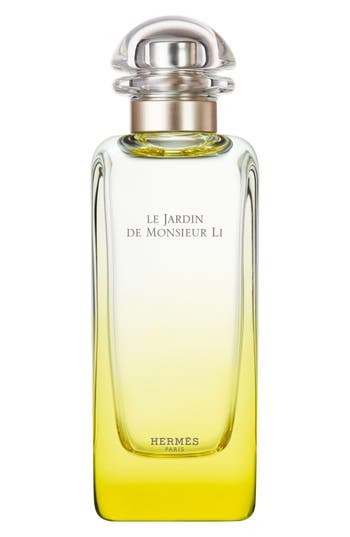 Style Name: Hermes Le Jardin De Monsieur Li - Eau De Toilette Spray. Style Number: 1094981. Available in stores. "I wanted to express the essence of femininity with flowers and nothing but flowers." - Jean-Claude Ellena. Femininity in perfume form! A celebration of the birth and rebirth of woman, every day, Jour d'Hermes brings to light the beauty of woman, while maintaining the mystery of each individual woman. A profusion of bouquets. From dawn to dusk, here is a floral that flowers, a blossom that blooms. Jour d'Hermes Pure perfume brings a new tonality full of generosity and depth, revealing women in a new light. Eminently feminine.0.25 oz. 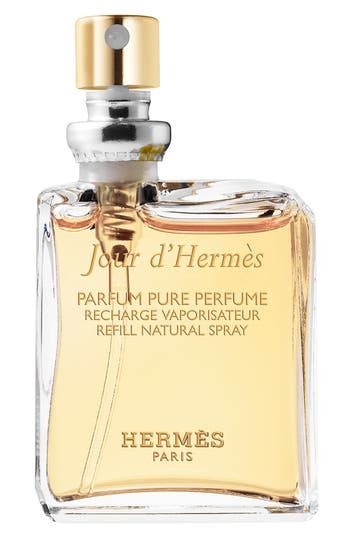 Style Name: Hermes Jour D'Hermes - Pure Perfume Lock Spray Refill. Style Number: 773580. Available in stores. "A perfume of leather and flowers, as light as an angel's wing." - Jean-Claude Ellena.A reminder of a visit to the Hermes leather vaults, Kelly Caleche is a light, feminine, joyous expression of leather. It gives a nod to two in-house emblems, and translates the perfumer's tactile and olfactory emotions into an evocation of leather worn next to the skin, gently tanned by the touch and edged with fresh petals. Eau de parfum, a generous floral harmony, a winning sweetness. Style Name: Hermes Kelly Caleche - Eau De Parfum. Style Number: 394612. Available in stores. 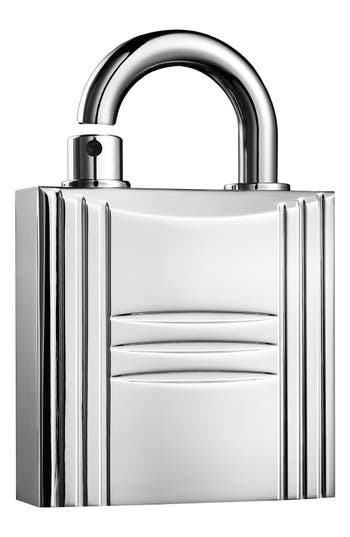 Fetish object and signature of each fragrance, the lock spray hosts feminine pure perfumes. Easy to carry and travel with, it is made to be taken out of a bag and admired. The lock spray is delivered empty and can be refilled over time with a choice of five feminine pure perfumes:- Jour d'Hermes Pure perfume brings a new tonality full of generosity and depth, revealing women in a new light. Eminently feminine- Parfum des Merveilles reveals itself provocative and gourmand- Caleche Pure perfume represents the extreme elegance and refinement of a floral bouquet, married with the nobility of the woods- 24 Faubourg Pure perfume is warm and sensual, glowing like a sunset- Kelly Caleche is an unexpected caress of leather among generous floral harmony. Holds 0.25 oz. Delivered empty. Perfume must be purchased separately. Style Name: Hermes Pure Perfume Refillable Lock Spray. Style Number: 498015. Available in stores. "The perfume of enchantment. An amber wood for women, surprising and magical." - Jean-Claude Ellena. From surprise to magic and from magic to enchantment, Eau des Merveilles leads us by the nose on a dream cloud. A multi-facetted novel built on a woody amber accord that resonates right through to the top notes, this fragrance was created in 2004 by Ralph Schwieger and Nathalie Feisthauer. It successfully takes on the challenge of being a sparkling women's perfume with not a flower in sight. The eau de parfum, appetising and sensual. 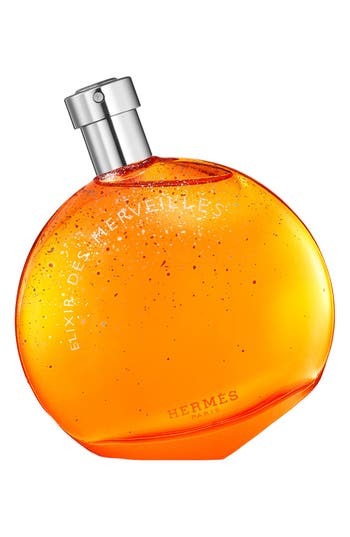 Style Name: Hermes Eau Des Merveilles Elixir Des Merveilles - Eau De Parfum. Style Number: 392989. Available in stores. "Perfume in the absolute. An explosion of white flowers, enveloping warmth, captivating sensuality." - Jean-Claude Ellena.A novel composed by Maurice Roucel in 1995, 24, Faubourg is an invitation to travel, with the sun as its destination. A sparkle of white flowers in the top notes, the radiance of a floral heart enveloped in irises, woods and mystery, while vanilla and ambergris set the tone for the sillage. Eau de parfum, the radiance of high noon. Style Name: Hermes 24, Faubourg - Eau De Parfum. Style Number: 394578. Available in stores. "Whereas there's usually very little neroli in perfumes, I used an abundance of it, out of love, out of the ordinary." -Jean-Claude EllenaWith Eau de Neroli Dore, his fifth creation in the colognes family, Jean-Claude Ellena has given full voice to neroli, the essence extracted from orange blossom and given its name in homage to Princess Nerola who perfumed her gloves with it. And he used saffron to heighten its lively, enveloping freshness. Moisturizing and protective, this unctuous balm rich in moisturizing and emollient agents soothes the skin and offers an immediate comfort sensation: the skin is supple and soft. Nongreasy, it can be used on face, hands and all over the body. Men can also use it as an after-shave- 6.7 oz. 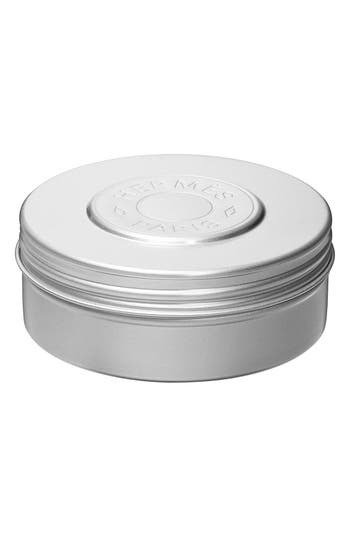 Style Name: Hermes Eau De Neroli Dore - Face And Body Moisturizing Balm. Style Number: 5161593. Available in stores. "The perfume of enchantment. An amber wood for women, surprising and magical." - Jean-Claude Ellena. From surprise to magic and from magic to enchantment, Eau des Merveilles leads us by the nose on a dream cloud. A multi-facetted novel built on a woody amber accord that resonates right through to the top notes, this fragrance was created in 2004 by Ralph Schwieger and Nathalie Feisthauer. It successfully takes on the challenge of being a sparkling women's perfume with not a flower in sight.A fluid formula easily absorbed. Moisturized, the skin is soft and supple, delicately perfumed. 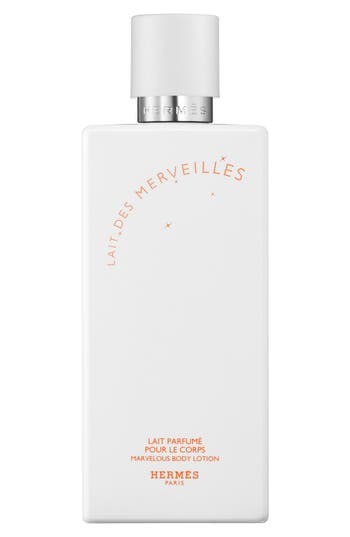 Style Name: Hermes Lait Des Merveilles - Perfumed Body Lotion. Style Number: 393001. Available in stores. "A bitter-sweet cologne: freedom in tradition." 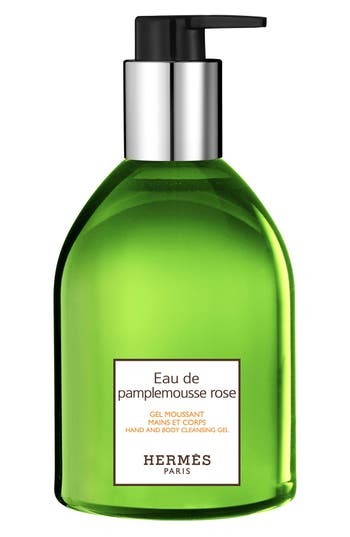 - Jean-Claude EllenaWith its classic approach favouring the liveliness and freshness of citrus fruits, Eau de Pamplemousse Rose is distinctive for the modern way it is written. The citrus theme of this novella, incarnated by grapefruit, takes on a new brilliance when it comes into contact with roses. Hand and body cleansing gel. A hand and body formula that transforms into a fine and generous foam; easy to rinse. Delicately scented, the skin is soft- 10 oz. 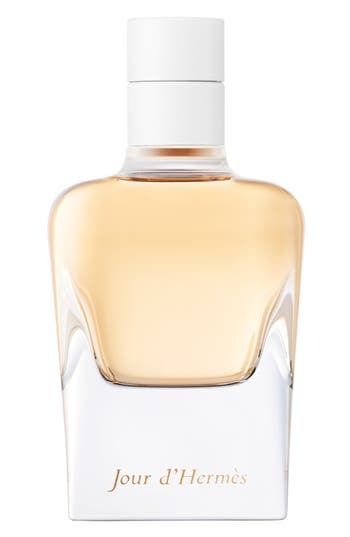 Style Name: Hermes Eau De Pamplemousse Rose - Hand And Body Cleansing Gel. Style Number: 1152149. Available in stores. "A counterpoint to tradition." - Jean-Claude Ellena. Conceived by Jean-Claude Ellena as an interpretation to act as a counterpoint to cologne style, Eau de Gentiane Blanche revisits the theme of freshness with spirit as well as delicacy. Complex and sophisticated, it reveals its different facets. Sometimes bitter, sometimes smooth, in an elegant vapour of white musks that achieve sweetness without facile sugariness, giving it a completely original olfactory counterpoint. Face and body moisturizing balm. An unctuous and generous moisturizing cream that offers a true comfort feeling. Nourished, the skin is soft and velvety, delicately perfumed- 6.7 oz. Style Name: Hermes Eau De Gentiane Blanche - Face And Body Moisturizing Balm. Style Number: 1151798. Available in stores. "I remembered the smell of ponds, the smell of jasmine, the smell of wet stones, of plum trees, kumquats and giant bamboos. It was all there, and in the ponds there were even carp steadily working towards their hundredth birthday." - Jean-Claude EllenaLe Jardin de Monsieur Li describes a Chinese garden somewhere between reality and imagination. A place for meditation where strolling is allied to thought, and every step sets the imagination free. Moisturizing body lotion. A fluid formula easily absorbed. Moisturized, the skin is soft and supple, delicately perfumed- 6.7 oz. 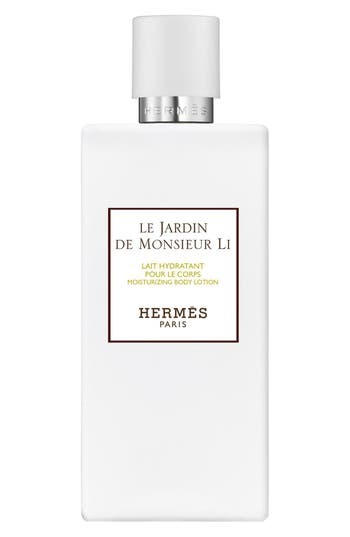 Style Name: Hermes Le Jardin De Monsieur Li - Moisturizing Body Lotion. Style Number: 1152143. Available in stores. "A perfumed expression of a Mediterranean memory, a mosaic of olfactory, visual and tactile sensations." -Jean-Claude EllenaA novella that describes the spirit of a Mediterranean garden luxuriant with trees and flowers, and evokes a mosaic of smells pilfered from a private garden in Tunisia. Like a travelogue, this perfume conjures an idyllic world of shadows, water and light, on the theme of a fig tree allied with Mediterranean zests. Moisturizing body lotion. A fluid formula easily absorbed. Moisturized, the skin is soft and supple, delicately perfumed- 6.7 oz. 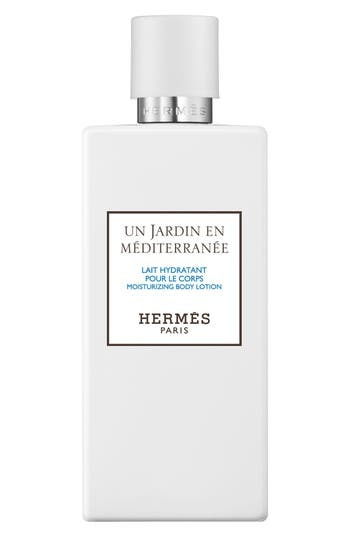 Style Name: Hermes Le Jardin En Mediterranee - Moisturizing Body Lotion. Style Number: 1152072. Available in stores. "I can think of no smell more joyful than mandarin, more mellow than amber." 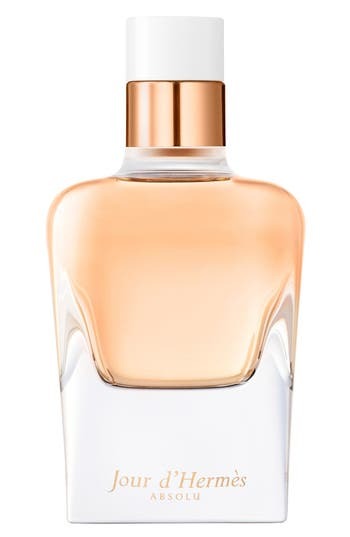 - Jean-Claude EllenaReinventing its classic connections with citrus fruits and freshness, Eau de Mandarine Ambree brings a vitality to cologne that is as mischievous as it is gentle. Intrinsically cheerful mandarin is combined with sparkling passion fruit which is itself revealed by the mellowness of amber. A novella that expresses a lively, shimmering, smooth paradise, captured in a colour. Hand and body cleansing gel. A hand and body formula that transforms into a fine and generous foam; easy to rinse. Delicately scented, the skin is soft- 10 oz. 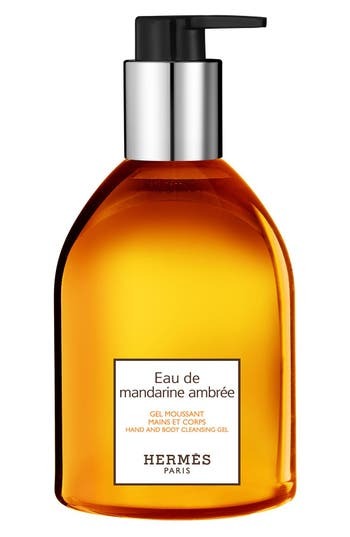 Style Name: Hermes Eau De Mandarine Ambree - Hand And Body Cleansing Gel. Style Number: 1152154. Available in stores. "A garden for fun, a garden that answers to no one, sprinkled with light." -Jean-Claude Ellena. Un Jardin sur le Toit is a lively, edgy novella. This perfume describes a secret garden, nestled in the heart of the city in Paris. A hanging garden, perched on the roof of the house of Hermes, at 24 Faubourg Saint-Honore. An apple tree, a pear tree, a magnolia in the Paris air, along with a few self-seeded imposters, all making up this perfume of light and pleasure, enticing and full of laughter. Moisturizing body lotion. A fluid formula easily absorbed. Moisturized, the skin is soft and supple, delicately perfumed- 6.7 oz. 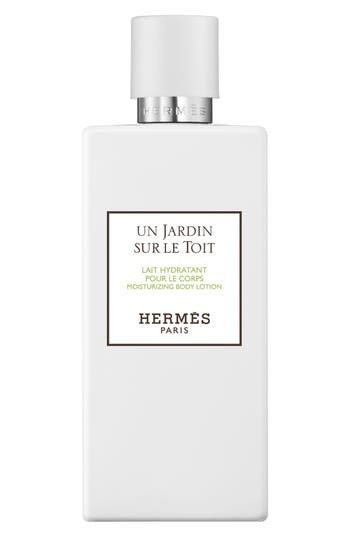 Style Name: Hermes Le Jardin Sur Le Toit - Moisturizing Body Lotion. Style Number: 1152068. Available in stores. "The perfume of enchantment. An amber wood for women, surprising and magical." - Jean-Claude Ellena. From surprise to magic and from magic to enchantment, Eau des Merveilles leads us by the nose on a dream cloud. A multi-facetted novel built on a woody amber accord that resonates right through to the top notes, this fragrance was created in 2004 by Ralph Schwieger and Nathalie Feisthauer. It successfully takes on the challenge of being a sparkling women's perfume with not a flower in sight. Perfumed body cream is an unctuous and generous moisturizing cream that offers a true feeling of comfort. Nourished, the skin is soft and velvety, delicately perfumed. Style Name: Hermes Eau Des Merveilles - Perfumed Body Cream. Style Number: 173284. Available in stores. The founding cologne created by Francoise Caron in 1979 and inspired by the smell of undergrowth moist with morning dew, this fragrance has asserted itself as an emblem of Hermes and stands out for its distinctive freshness. A novella perfume conceived as an explosion of citrus notes with orange playing the central role between zests and leaves, lemon, mandarin, mint and blackcurrant bud. Eau d'Orange Verte reveals its complexity in a unique sillage comprising oak moss and patchouli. Face and body moisturizing balm. An unctuous and generous moisturizing cream that offers a true comfort feeling. Nourished, the skin is soft and velvety, delicately perfumed- 6.7 oz. Style Name: Hermes Eau D'Orange Verte - Face And Body Moisturizing Balm. Style Number: 1151588. Available in stores. "A bitter-sweet cologne: freedom in tradition." - Jean-Claude EllenaWith its classic approach favouring the liveliness and freshness of citrus fruits, Eau de Pamplemousse Rose is distinctive for the modern way it is written. The citrus theme of this novella, incarnated by grapefruit, takes on a new brilliance when it comes into contact with roses. Face and body moisturizing balm. An unctuous and generous moisturizing cream that offers a true comfort feeling. Nourished, the skin is soft and velvety, delicately perfumed- 6.7 oz. 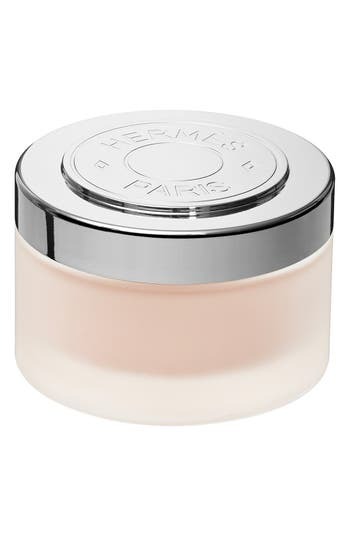 Style Name: Hermes Eau De Pamplemousse Rose - Face And Body Moisturizing Balm. Style Number: 1152145. Available in stores. "I've always loved the duality of rhubarb. A double duality: visual and olfactory. The green colour metamorphoses into red. Starting acidic and crisp, its smell becomes smooth and velvety." -Christine NagelWith Eau de Rhubarbe Ecarlate Christine Nagel has created her first cologne for Hermes. Unprecedented and bold, more vegetal than citrus, it gives us the crisp, acidic freshness of rhubarb made velvet-smooth with white musks. Moisturizing and protective, this unctuous balm rich in moisturizing and emollient agents soothes the skin and offers an immediate comfort sensation: the skin is left supple and soft. Nongreasy, it can be used on face, hands and all over the body. Men can also use it as an after-shave- 6.7 oz. Style Name: Hermes Eau De Rhubarbe Ecarlate - Face And Body Moisturizing Balm. Style Number: 5161597. Available in stores.